In order to identify the best data and phone cabling solution, the perfect network infrastructure needs to be designed to best meet your specific requirements. Implementation for your structured cabling network is determined by many factors: your businesses current bandwidth usage, your network environment and your future growth expectations. In order to identify the best data and phone cabling solution, the perfect network infrastructure needs to be designed to best meet your specific requirements for clients in Cleveland and Northeast Ohio. 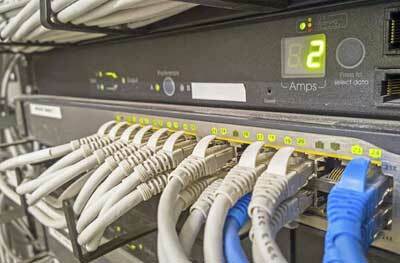 Wiring systems for voice communication installation has remained virtually unchanged over the last twenty years. However, with changes in business applications requiring voice application support, graphics, digital network connections and other services to be all integrated into a standardized cabling system, detailed consideration of the initial installation of the infrastructure is all important. This new age of unified multimedia in the telecommunications industry has given birth to the creation of the high-performance network infrastructure. System designers plan phone and cabling data infrastructure with a businesses present and future applications and data usage in mind. A company that currently has 15 workstations in usage and grows to 100 workstations within the next two years, with the proper telecommunication infrastructure, has the flexibility. A high-integrity network will ensure that today's phone and data cabling equipment will function properly if the correct cabling is installed. Portman Electric Inc. has licensed, certified electrical professionals who are experienced in planning and installing various media solutions for your business. Whether it is Cat5, Cat5e, Cat6, Cat3, fiber optics of coaxial cable, Portmans' experience as an industrial and commercial electrical contractor has electricians that will install your system professionally and in accordance with IEEE standards. 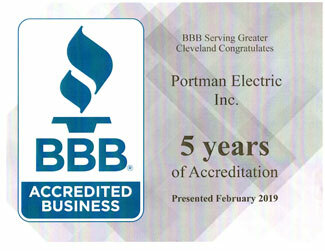 Many of our customers have chosen Portman Electric, Inc. to install their phone and data cabling infrastructure because of our commitment to honesty, fairness and our 28 years of service providing quality work in Cleveland & Northeast Ohio. So for your phone and data cabling needs, contact Portman Electric, Inc. and let one of our highly skilled, safety trained professionals help you design the proper telecommunication network infrastructure for your business. "Showed up on time. Justin and his co-worker were plesant and very professional. They went right to work installing the new 17k generac generator. Justin noticed that a prior electrician had made a mess of our 400 amp panel. He went out of his way to rewire the panel and bring it up to code. Everything they did was very neat and professional. When the job was finished you would never know they were there. I am going to have them back to do outside lighting in the spring."